'We're going to Disney World!' Yes. 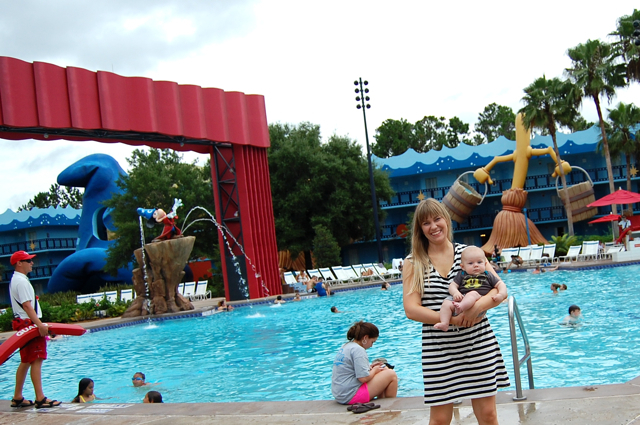 Our first official day in Orlando started off pretty sweet. We kept it a secret until we actually got there. Up until then, we only told Lo that we were driving to Florida and going to the beach. Which was true ... Disney was just the (surprise) cherry on top. She was pretty stoked. Bowie was indifferent. But he was in for a fun day, too. 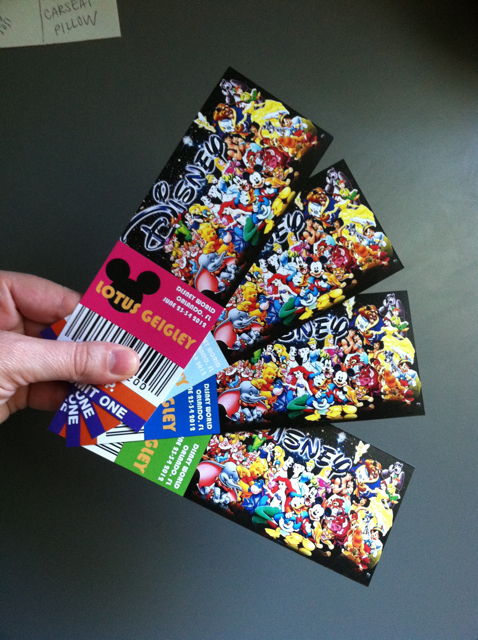 I had made some fake Disney tickets with our names on them to make the surprise more real for Lo. We gave each kid a pair of Mickey ears and told them we were really going. That day. Like, right now. We met up with Bo's family at our rad hotel. The kids loved checking everything out. 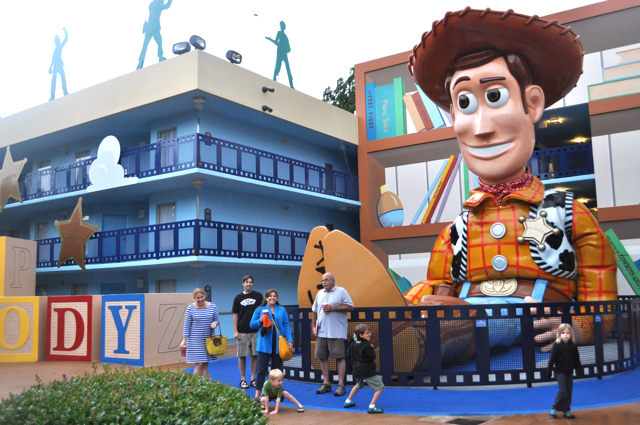 We stayed onsite at Disney's All-Star Movies Resort, which had enormous statues of characters from Fantasia, Toy Story, 101 Dalmations and other animated movies. We decided to hit the pool first to let the kids hang and relax. This would be Lo pretending to be shivering next to an 'iceberg' at the kiddie pool. Even Bowie got to dip his toes in for a bit. 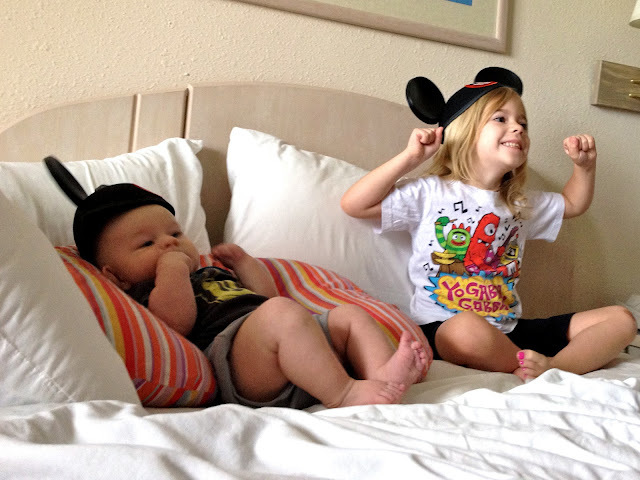 It was late in the day, so we hit up Downtown Disney and had dinner, then came back to the hotel and hit the hay. The next morning, we woke up to a rather rainy situation. Hmmm. This would be that whole Tropical Storm Debby thing. This was our day at Disney World, however, so we grabbed our jackets, stroller rain covers and super attractive plastic rain ponchos and went for it. 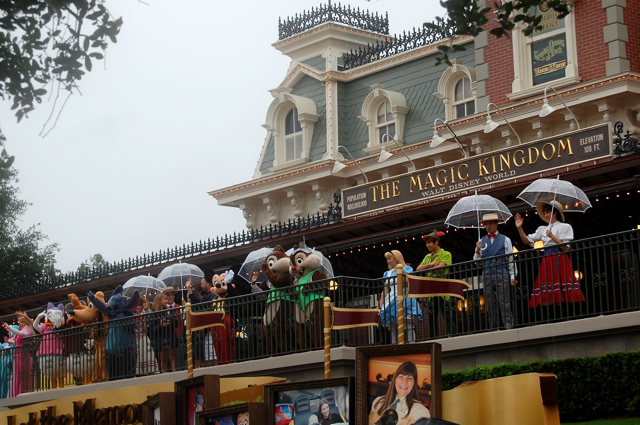 We got to see the little show with all of the characters as the park opened. Yo, Mickey! See him waving at us? We hit up the rides that were under cover if we could, and checked out some of the shows that were indoors. 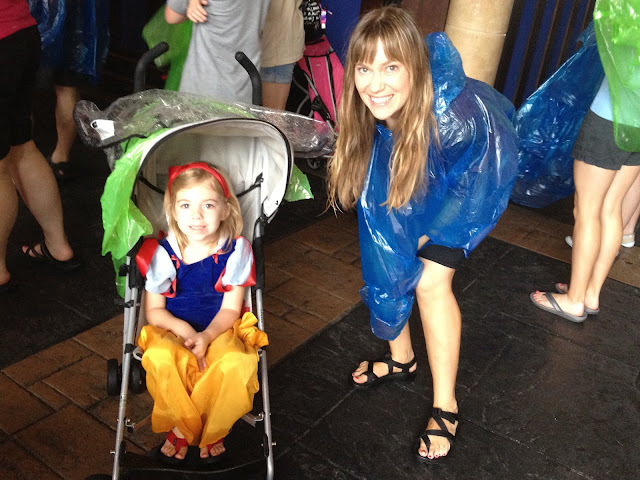 Luckily, lots of rides were covered so we still had lots of fun. At least we weren't baking in the sun, and the lines were short! The one ride that Lo had her heart set on was Dumbo, which was totally out in the open, but we were wet anyway and rode that thing about seven times. It was still fun and she loved every minute of it. We eventually hit a point in the day where we were all tired, soaking wet, and needed a break. 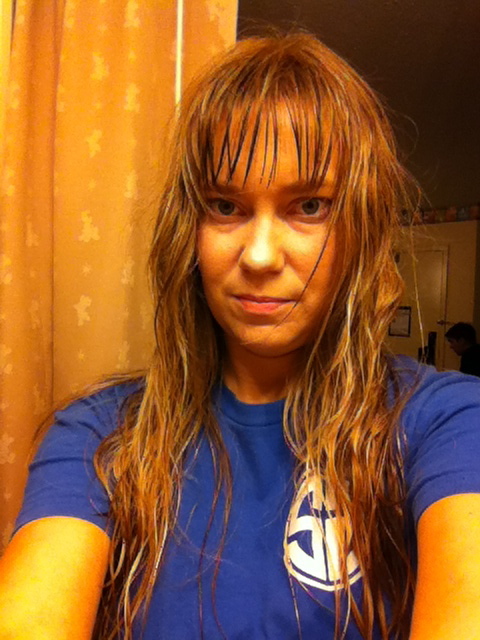 We went back to our hotel and dried off a bit. We ordered pizza and the kids chilled out and played Cut the Rope while we decided if we wanted to head back to the park, or call it a day. 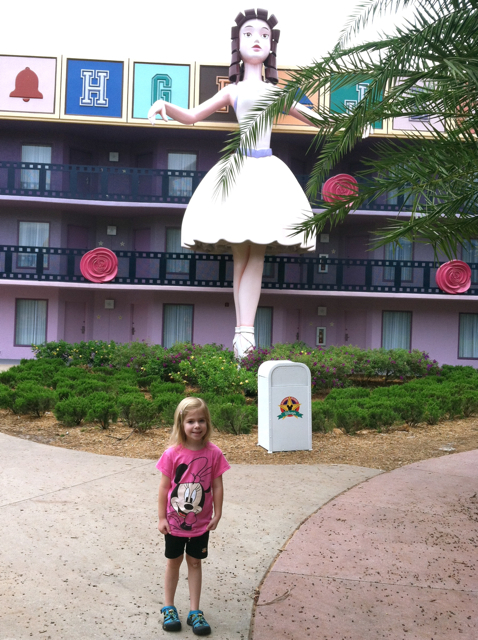 And call us crazy, but we hadn't had enough of Disney World yet. The rain tapered off a bit and we went back out for some nighttime fun. Our little fam stuck it out until the very end and got to see the light show that's projected on the castle. 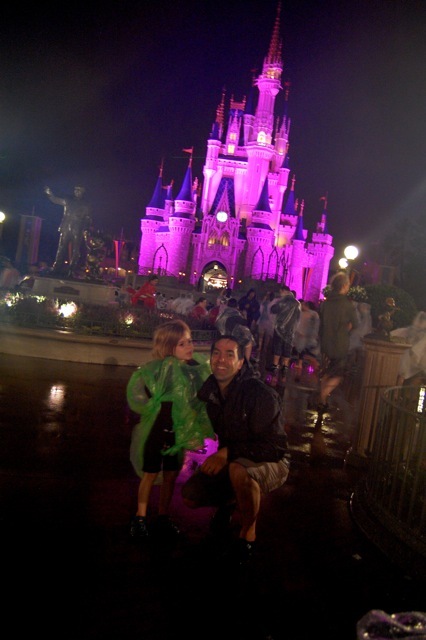 And then, much to our delight, they still had the fireworks over the castle in the rain. Yay! 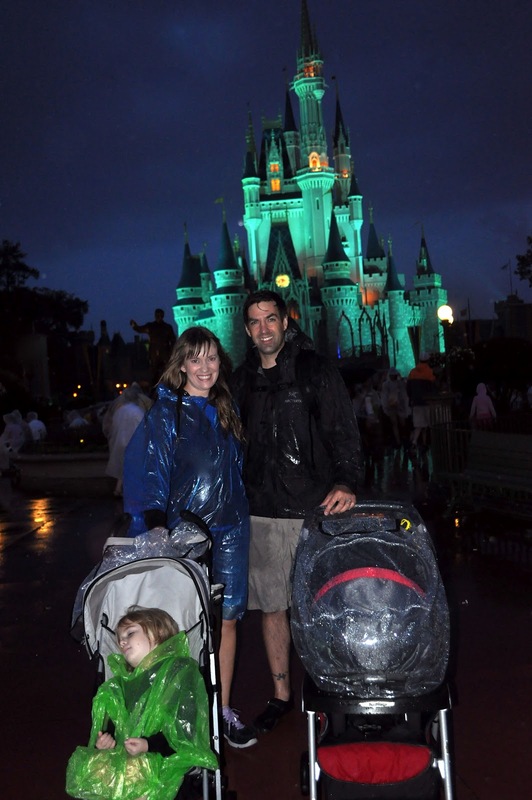 It was the perfect ending to our rainy day at Disney. Our little sweetie went to bed with a magic wand in hand, making wishes on stars and talking about the day. 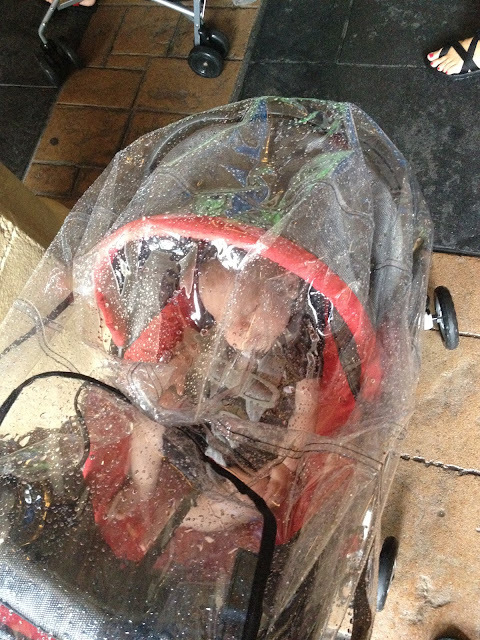 She didn't even care about the rain. Magic and memories. That's what it's all about. Lovely family bonding time! Makes me want to plan our next Disney trip. Fun pictures! We'll have our trip planned in a few weeks..so excited! 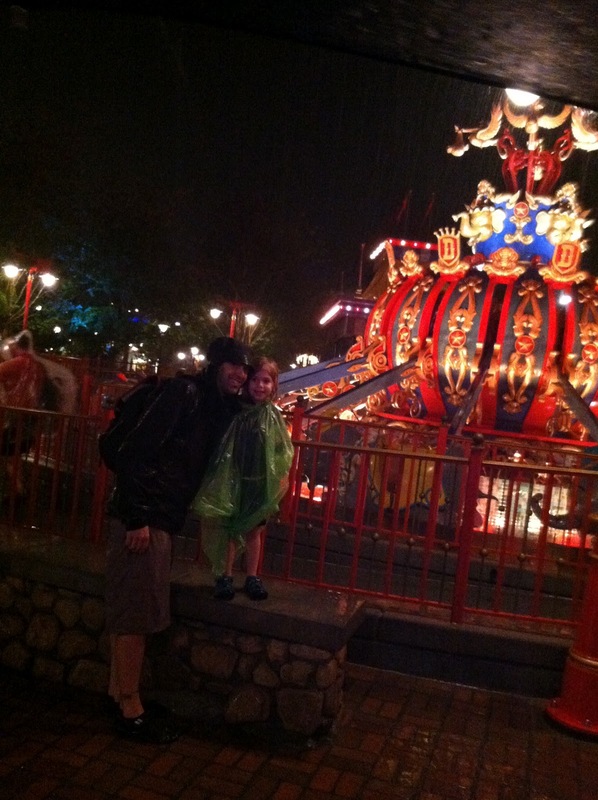 Disneyland was such a fun trip for our family it leaves me daydreaming about going back. Nice post! Looking forward to taking our little one soon. This is so, so cute! I'm glad you guys had such a great time despite the rain! We're planning a Disney trip next Spring and this just makes me even more ridiculously excited! !